This is a continuation of our Black line. Very slick with it being a powder coat black with stainless arms and Brass fixtures. Pictuer shows Stainless fixturesbut will ship with Brass. Gas cap is flip-open vented cap that compliments the post war bobber styling. The Speedster cap is a modern take on vintage Indy race car hardware, and it’s showing up on signature bikes built by Chica, Paul Yaffe and Cyril Huze. The cap bolts to a weld-in boss that you can add to any tank. 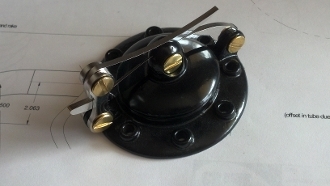 The cap is with Brass fictures, weld-in bosses are available separately in both steel and aluminum. The Speedster cap is satin finished cast aluminum, 3 1/8" in diameter. The cap is vented. The pivot arms are mirror-finished stainless steel, and the cap is available with the pivots and mounting screws in stainless. A bung must be welded into the tank to mount this cap. A gasket is included with the cap, replacement gaskets and o-rings are available if needed.